Observation - Frog spawn? - UK and Ireland. Description: On grass, 10m away from a pond which was full of frog spawn. Can anyone give a reason? 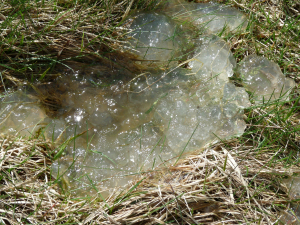 On grass, 10m away from a pond which was full of frog spawn. Can anyone give a reason?